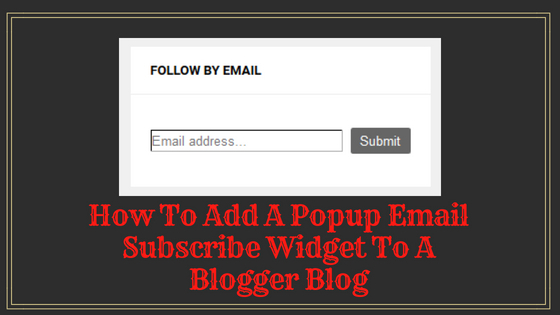 Popup Email Subscribe Widget To A Blogger Blog - Hello Friend's In today's article, we are going to tell you How To Add A Popup Email Subscribe Widget To A Blogger Blog. Friends, all of you have read about Email Marketing, in which you can tell people about your Website and Latest Update through Email. By doing this, people get information about your website and they visit your website, so you can easily increase Traffic on your website. Now the first question is how can you get an email address of people interested in your topic? Now the second benefit of Email Subscribe Box is that whenever you make some latest updates on your website, your subscribers will receive direct email send and they get the information of your latest update. But to do this, you have to get help from Online Tools, for which Feedburner is a better tool for you because it's Google's product and it's totally free. You just have to create Feedburner account, and then you can use Subscribers to your Feedburner Feed URL. The PopUp Email Subscribe box is displayed on the front of your website in the same way that your readers want it or they want to follow or ignore it. In such a situation, chances are very high that people subscribe to your website so that you can increase as many subscribers very easily. PopUp Email Subscribe Box is responsive so that they work well on desktops, laptops, mobile and tablets. See Look Wise, PopUp Email is very good to see the Subscribe Box and give your website a Professional Look Provide. PopUp always distracts readers. As a result, interest less is reduced to reading from the topic that he visited on your website for reading. Normally most people do not like to open such a website that pops up. Popup Email Subscribers are better for growing, but they also distract your readers. Therefore, it is much better than Adding PopUp Subscribe Box to add the Subscribe Box in the sidebar. 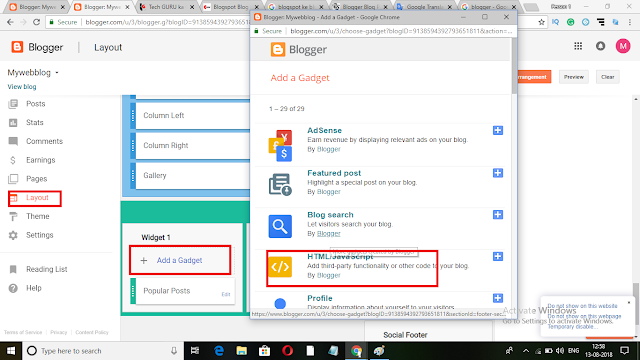 Now if you do not want to add the Subscribe Box in the Sidebar, then we have already published Blogger Blog Par, which has published the article. You can easily add the Subscribe Box to your Blogger Blog by reading that article. 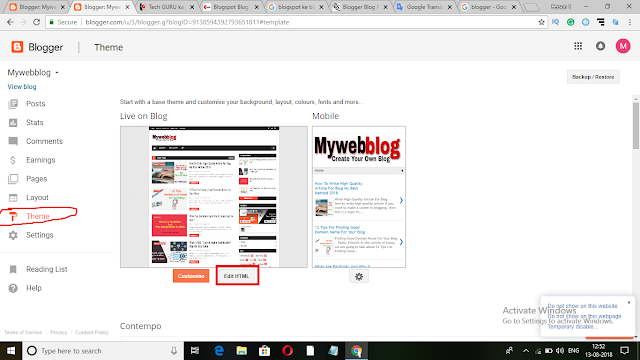 Blogger Blog Par PopUp Email Adding a Subscribe Box is very easy, you just have to follow some basic steps and you can easily add Blogger Blog Par Popup Email Subscribe Box. Note: To add this PopUp Email Subscribe Box, you must have a Feedburner account, so if you do not have a Feedburner account, first create your Feedburner Account. First of all, log in to your Blogger Dashboard, for which you can visit Blogger's Official Website Blogger.com and log in with your Login Id & Password. 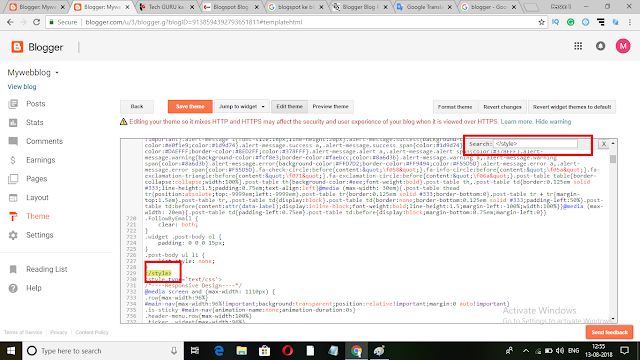 You first have to copy the given code first and paste it into the HTML section of your blog. 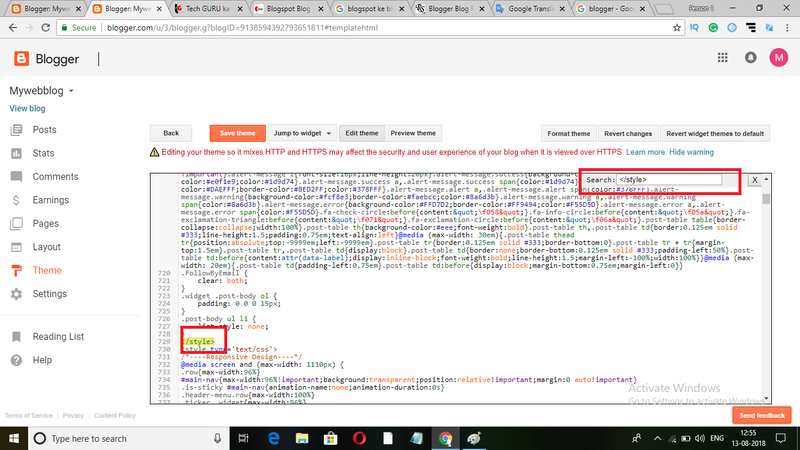 When you log in to Blogger's Dashboard, Right Hand Side gives you some options in which you get an option of the theme. Click on the option of that theme. On going to the Theme Option, you get an option of your Theme and its option of right HTML, as you can see in the image shown above. You have to click on the option of that HTML. After clicking on the option of HTML, you have CodingOpen of your entire theme, in which you have to do the Style section. To find the Style section, first press Ctrl + F Button from Keyboard, which gives you a Search Box next to your Coding. Now in that search box, you have to type </ style> Word and search for it so that you get the Style section of your theme. After finding the Style section, you can make a little space by pressing Enter on the word </ style> above the word so that you can paste the code given below. 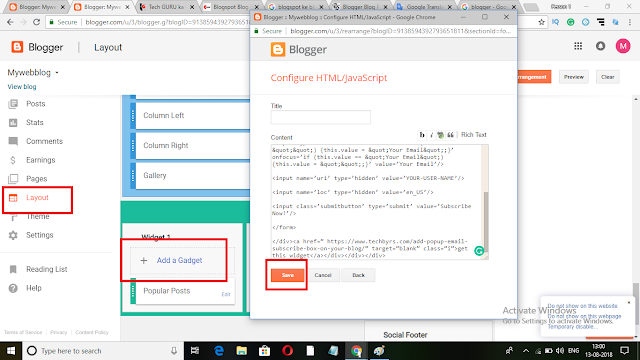 Now select the complete code below and copy it, and paste it on the right side of your Blogger Dashboard where you searched the <Style> section and click on the option of "Save Template". After clicking on the option of Save Template, the settings for Popup Subscribable Button in your template have been completed, now you need to add the Blogger Blog Par Popup Email Subscribe Widget for which you can follow the following steps. Have to do. 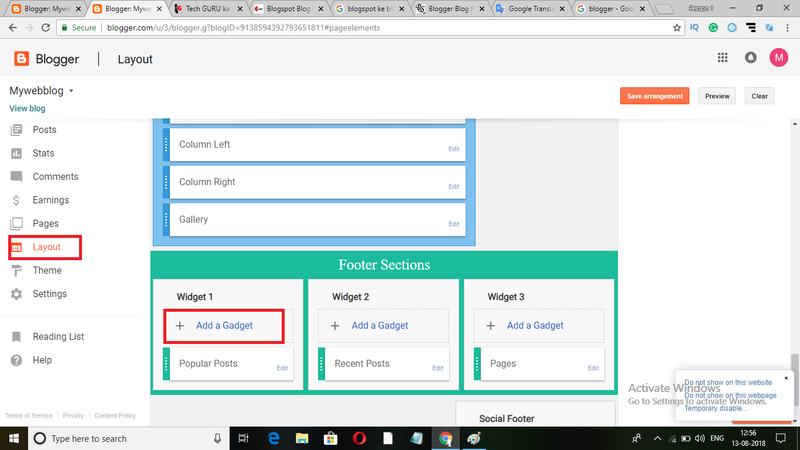 To add any widget to Blogger, you have to go to the Layout option. For which you see in the right sidebar on the Blogger Dashboard, you get an option of Layout. Click on the option of the Layout that lets you open your Theme's Backhand Open. Now you copy the code given below and paste this code before you paste it on Notepad or Wordpad because in this code you will get the address of our website which you have to replace from your website's address. Along with this, you will see techbyrs written in some other places, which you have to replace with the name of your website. After making changes in the code given above, click on the Add a Widget option in the Layout section, from which you get the Widgets provided by Blogger. You only have to click on the HTML / Java Script Widget. Through this widget, you can place Coding on your theme. Now after clicking on the HTML / Java Script Widget, another popup box opens in front of you where you have to give the title or content. Leave the box of Title blank (Blank) so that it does not show on your website that where you have installed that code. In the box of content, paste the code you edited and click on the Save button. Now in the last, you have to click on the option of the Save Arrangement in the Layout section above, so that all the settings you have made will be saved on your blog well. Now when you open your blog, you will see that your Popup Email Subscribe Widget To A Blogger Blog is well added.